Complete Instructions on How To Protect, Preserve and Save Your Family History, Heirlooms and Collectibles, by Scott M. Haskins. Includes continuing education with periodic e-mail tips and how-to videos to encourage and teach you. Have you ever lost a possession that was dear to you in an accident or disaster? Ceramic that broke, a book that was ruined by water or photos that stuck together in a pile? Conservator Scott Haskins offers the help you need! 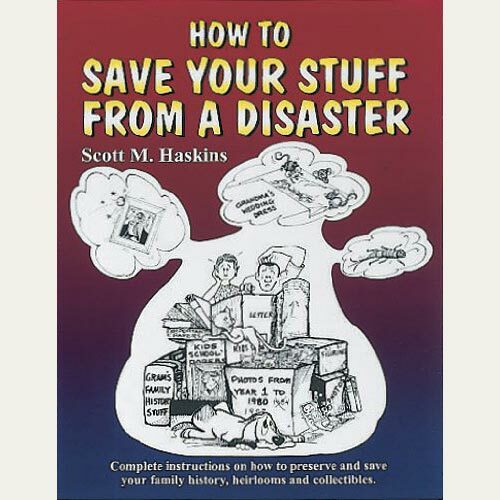 This easy to read and down to earth disaster preparedness handbook helps anyone learn to preserve and protect their family history, photos, collectables… and basically all the stuff we accumulate and treasure. Also, learn how to respond and save your stuff when disasters hit, like earthquakes, floods… or grandkids! After all, anytime you loose something dear to your family’s history, its a disaster. The book’s step by step instructions and abundant pictures make the information easy to follow. Save wet papers, photos, and books. Find out what to do if a picture frame gets bashed, what to use if your porcelains are knocked off the shelf and how to get the burnt smell out of your books after a fire. But that’s not all, find lists of all the supplies you need and where to buy them. Get the facts on filing insurance claims and how to find a professional conservator (restorer) when you need one. This book has been reviewed by the conservation community, the disaster response industry, professionals from museums and auction houses, genealogical professionals and always receives the highest compliments and votes.